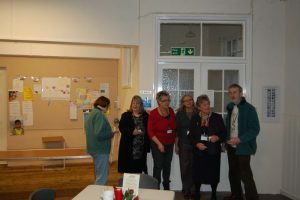 The Rye branch of the Bexhill Foodbank celebrates its fourth birthday this week, since its opening on December 4, 2014 as reported in Rye News. With the support of an enthusiastic band of volunteer helpers, the Rye Foodbank has helped to feed many local families and individuals over this period. Particularly likely to be in need are those caught in a temporary financial bind, for example on changing jobs, awaiting pay from new employment, or an onset of sickness in the family. Upon referral from a number of helpful sources, perhaps a social worker, school, doctor’s surgery, or other body with caring responsibility, a certificate is obtained and taken on a Wednesday afternoon to Rye Baptist Church in Cinque Ports Street, where a food parcel may be obtained. Originally this emergency aid was limited to a three-week assistance, but today the rules are relaxed and rarely is anyone turned away. The number of applicants varies considerably from week to week, with less activity noted in school holidays and more in the period in the New Year after Christmas. This makes for some difficulty in the deployment of volunteers to ‘interview’ the applicants over a cup of tea and ascertain their food and nutritional requirements. Behind the scenes lies quite a formidable organisation, under the supervision of John Gurney. 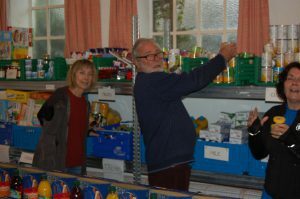 Stores are sorted and listed by volunteers at the Methodist Church, having been received from food collection points in local churches or purchased from a supermarket, using funds donated for that purpose. The storage racking in the mini warehouse is kept “shipshape and Bristol fashion” as the Navy saying goes, with everything sorted in its proper place ready to respond to food requisitions lists sent in from the front line. Quality control is strict, with only tinned goods well within date being stored, for distribution as required via the Baptist Church each Wednesday afternoon (1-3pm). In the event that the ‘sell-by’ date approaches too close, the produce is reluctantly discarded and sent to landfill – it is not allowed to be given away or even sold at discounted price. Collecting points have also been set up in local stores, including Jempson’s, the Co-op in Winchelsea Beach, Cost Cutters in Rye, the Nisa store at Pontins in Camber and the Rye Harbour Stores. If you would like to help, there is a “shopping list” of essential supplies. Click on these links for more information on the foodbank and the shopping list . When I visited the warehouse on Thursday, December 6, Christmas hampers hada just been delivered by the Methodist Church. Without doubt, the Rye Foodbank enjoys tremendously generous local support. Everyone will be welcome on the evening to join in the singing in what is a magnificent 12th century Church. On average £500 has been raised each year for local organisations and it is hoped this figure can be matched or even exceeded on the night. The Harvest Praise this year raised £250 for the Food Bank, recognising not only its value in these difficult times, but also the very hard work undertaken by the dedicated team of helpers.